Urinary tract infection (UTI) is the most common serious bacterial infection in early childhood.,,, Appropriate diagnosis and treatment prevent complications such as renal scarring, hypertension, proteinuria, and end-stage renal disease.,,,,,, About 8% of girls and 2% of boys experience at least one episode of UTI upto the age of 7. Early, aggressive antibiotic treatment has been recommended for symptoms suggestive of UTI in young children to prevent renal scarring. The results of urine culture, which is the gold standard diagnostic test for UTI, may not be available for 48--72 h. The sensitivity of commonly used screening tests such as pyuria and positive urine nitrite test are low as shown by several studies.,, Pyuria may also be absent in infections with Proteus species. Hence, novel markers for the rapid and accurate diagnosis of UTI would help in the early initiation of treatment in children with suspected UTI, pending urine culture results. Neutrophil gelatinase-associated lipocalin (NGAL), also known as Lipocalin 2, is an iron carrier protein that is abundantly expressed in human neutrophils and also in monocytes/macrophages., NGAL serves as a mediator of the innate immune response in mammals. Its transcription is induced by bacterial lipopolysaccharides. There are some animal studies which had shown urinary NGAL (uNGAL) to be an useful marker to detect UTI as it is upregulated in the presence of inflammation and infection. We aimed to determine the usefulness of uNGAL in early detection of UTI in children less than 5 years of age with symptoms suggestive of UTI. We further aimed to calculate the optimal cutoff level of uNGAL in predicting UTI in this group of children. This prospective study was conducted in the Department of Paediatrics in a tertiary care teaching hospital located in South India between January 2012 and June 2013. Written informed consent was obtained from the parents of study participants. The institutional review board approved the study protocol. The inclusion criteria was children between the age of 3 months and 5 years with symptoms suggestive of UTI such as fever, nausea, vomiting, abdominal pain/back pain, straining/poor urinary stream, foul smelling urine, dysuria, frequency, urgency of micturition, diarrhoea, and urine white blood cell (WBC) >5/cu.mm or urine WBC >11/cu.mm alone. The exclusion criteria were refusal to participate, chronic kidney disease, and knowledge of pre-existing vesicoureteric reflux. Sample size was calculated using the following formula, with specificity of 76% from the existing study and precision rate of 8.5%. One hundred and fifty children were recruited for the study, of which 50 were excluded. (refusal to participate, chronic kidney disease, and knowledge of pre-existing vesicoureteric reflux). Basic demographic details were collected for 100 children who formed the study group. All children had urine sample collection prior to the initiation of antibiotics. Suprapubic aspirate (SPA) urine samples for uNGAL levels and urine culture were collected for children aged between 3 months to 3 years. For children between 3 and 5 years, midstream clean catch urine samples were obtained. The reference standard was urine culture, done by the department of Clinical Microbiology, according to the standard operating protocols. Turnaround time for urine culture was 48 h. The urine culture was considered positive, if there was growth of >105 CFU/ml of one organism in midstream clean catch urine samples and growth of any organism irrespective of colony count in SPA aspirate urine samples. The index test was urine NGAL, determined using human NGAL/lipocalin-2 particle enhanced turbidometricimmuno assay, supplied from Bioporto diagnostics. The urine samples were stored at −70°C till further processing. On the day of running the test, the sample was thawed for 1 h and centrifuged at 2,000 rpm for 10 min. It was then processed using the Roche Modular P-800 automated chemistry analyser (Roche Diagnostics, Germany). NGAL results can be made available in 3 h, if adopted as a routine test and in 90 min, if adopted as an urgent test, in contrast to urine culture results, which would not be available for 48--72 h. Normally, NGAL is present in negligible amounts in urine. Hence, raised levels of uNGAL in children with UTI are of diagnostic value. Urine NGAL levels were expressed in nanograms/ml (ng/ml). The index test was interpreted independent of the urine culture results. Statistical analysis was done using SPSS 18 software. The sensitivity and specificity of uNGAL estimation as a marker of UTI was compared with urine WBC estimation in children with culture positivity. 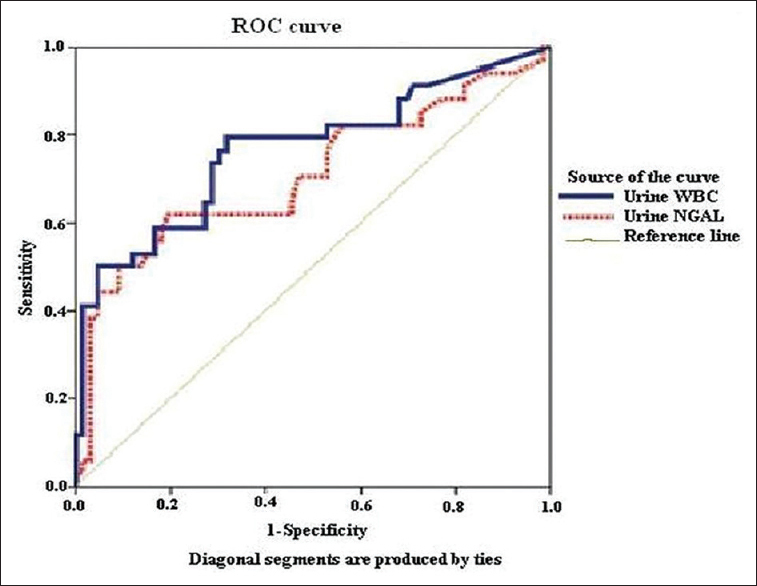 Receiver operating curve (ROC) analysis was performed to determine the sensitivity and specificity of different cutoff points for uNGAL and urine WBC estimation to predict UTI. The most appropriate cutoff point was chosen according to ROC analysis and the area under the curve (AUC) was calculated. The positive and negative predictive values and likelihood ratios were also calculated. Majority of children were between 3 and 12 months of age (51%), 13% were between 13 and 24 months of age, and 36% were between 25 and 60 months of age. The mean age was 22.09 months (range: 3--60 months). The female:male ratio was 1.3:1. Fever was the most common symptom and was seen in 85% of patients. Fever was the only presenting symptom in 36% of children. Vomiting was the next most common symptom, seen in 26% of children, followed by loose stools in 24%, dysuria in 18%, and straining while voiding in 16% of children. All children received broad spectrum antibiotics (third generation cephalosporins) after obtaining urine culture and urine NGAL samples. (IQR: 2.73--193.58). Thirty four percent of the patients had culture-positive UTI. The predominant organism grown in urine was Escherichia coli (E. coli) in 28/34 cases (82%), followed by Enterococcus species in 3/34 (9%), Klebsiella species in 2/34 (6%), and Citrobacter species in 1/34 children (3%). Seventy two percent had extended spectrum beta lactamase (ESBL) producing strains of E. coli, which were resistant to cephalosporin antibiotics. None of the patients who had culture-positive UTI had systemic sepsis. Children who were suspected to have UTI but had negative urine culture were diagnosed with various other conditions like enteric fever, acute gastroenteritis, viral fever, dengue fever, and rickettsial fever. ROC analysis revealed that the AUC for uNGAL was 0.76 and that of urine WBC was 0.70 [Figure 1]. Urine NGAL level was a more sensitive and specific marker of UTI at the cutoff level of 27 ng/ml [odds Ratio: 8.2; 95% confidence interval (CI): 3.1--22.1] with sensitivity of 79.4% and specificity of 68.2%, when compared with urine WBC >38/cu.mm (odds Ratio: 2.7; 95% CI: 1.12--6.5). The sensitivity of urine WBC was 70.6% and specificity of 53%, respectively, in predicting UTI [Table 1]. The positive predictive value (PPV) and negative predictive value (NPV) of uNGAL were 56% and 87% and that of urine WBC >38/cu.mm was 44% and 78%, respectively. The positive likelihood ratio and negative likelihood ratio of urine NGAL was 2.47 and 0.31 and that of urine WBC >38/cu.mm was 1.49 and 0.57, respectively [Table 2]. Urine NGAL (at the cutoff level of 27 ng/ml) compared favorably to urine WBC >38/cu.mm. The AUC of urine NGAL for children >1 year was 0.72 and for children <1 year was 0.79. The sensitivity and specificity of urine NGAL for predicting UTI was more in children <1 year of age [Table 3]. The median urine NGAL value was higher in patients with culture positivity as compared with those with a negative urine culture result (223.20 versus 13.65, P = 0.0001). There was no significant difference in the mean urine NGAL value between infections caused by E. coli and other organisms. Novel markers for the rapid and accurate diagnosis of UTI would help in the early initiation of treatment in children with suspected UTI, pending urine culture results. NGAL has been postulated as a marker. There are some animal studies which had shown urine NGAL to be a useful marker to detect UTI. Our study objectives are of particular relevance to practicing general pediatricians and pediatric nephrologists, who often come across children with UTI and for whom the improved ability to predict UTI for the early initiation of antibiotic treatment is necessary. We found that the optimal cutoff point of urine NGAL to predict UTI was 27 ng/ml (odds Ratio: 8.3, CI: 3.1--22.1). Urine NGAL was found to be more sensitive and specific than urine WBC estimation in predicting UTI. Similarly, Ichino et al. described that uNGAL increased in early stages of experimental pyelonephritis in rats. In another study done in 60 patients with UTI and 29 healthy controls aged from 2 months to 12 years, the mean uNGAL level was significantly higher in the UTI group than in the controls (91.02 ng/ml versus 14.29 ng/ml, P = 0.0001). In the same study, using a cutoff 20 ng/ml for uNGAL for the diagnosis of UTI, sensitivity and specificity were 97% and 76%, respectively (AUC, 0.979) and the optimal cutoff value for prediction of UTI was lower than the values determined for acute kidney injury. The higher sensitivity and specificity in the above-mentioned study as compared with our study can be attributed to the different patient age groups. In our study, we found that the sensitivity and specificity of urine NGAL for predicting UTI was more in children <1 year of age as compared with older children [Table 3]. In yet another study to predict uNGAL as a biomarker in the differential diagnosis of impairment of kidney function in cirrhosis, investigators found that participants with UTI (n = 25) had significantly higher uNGAL levels compared with those without UTI (n = 216) (median 166 mcg/g of creatinine vs 42 mcg/g of creatinine, P < 0.0001). Around the same time as our study, Lubell et al. studied uNGAL levels in infants between 3 months and 2 years. A total of 260 children with suspected UTI were screened. A urine culture positivity of 14% was obtained. They were able to demonstrate very high sensitivity 93% and specificity 95% at a cutoff value of 39.1 ng/ml. These higher levels may be explained by the fact that only children with history of significant fever were screened for UTI. In our study, increasing the cutoff value for NGAL to 39.1 would have lowered the sensitivity, although it may have increased the specificity marginally. Later studies by Lee et al. comparing KIM 1 and uNGAL as biomarkers for early detection of UTI also had an ROC curve with AUC of 91%. The study by Valdimarsson et al. also demonstrated a higher sensitivity of 93% and specificity of 95% for predicting UTI at a cutoff of 38 ng/ml in febrile infants. There were a few limitations to our study. We compared only urine WBC counts with uNGAL levels. If other screening tests such as urine dipstick, bacteriuria were also compared with urine NGAL, the best combination of screening tests could have been identified. Further uNGAL levels also rise in acute kidney injury in critically ill patients and chronic kidney disease, this may limit its use.,, Hence, further large trials are needed to compare uNGAL with other screening tests as well to make its use feasible in routine clinical practice. This study, the first on Indian children, demonstrated uNGAL is a promising marker to detect simple, uncomplicated UTI in young children. The sensitivity and specificity of uNGAL was better than that of urine WBC, which is the commonly used screening test. We sincerely thank the children and their parents for participating in our study. We express our sincere gratitude to our Institution's Fluid Research Grant for providing us with the financial support. Jakovljević E, Ilić K, Jelesić Z, Konstantinidis G. A one-year prospective study on the antibiotic resistance of E. coli strains isolated in urinary specimens of children hospitalized at the University Pediatric Medical Center in Novi Sad, Serbia. Infection 2013;41:1111-9. Goldman RD. Cranberry juice for urinary tract infection in children. Can Fam Physician 2012;58:398-401. Shaikh N, Morone NE, Lopez J, Chianese J, Sangvai S, D'Amico F, et al. Does this child have a urinary tract infection? JAMA 2007;298:2895-904. Downing H, Thomas-Jones E, Gal M, Waldron CA, Sterne J, Hollingworth W, et al. The diagnosis of urinary tract infections in young children (DUTY): Protocol for a diagnostic and prospective observational study to derive and validate a clinical algorithm for the diagnosis of UTI in children presenting to primary care with an acute illness. BMC Infect Dis 2012;12:158. Nickavar A, Sotoudeh K. Treatment and prophylaxis in pediatric urinary tract infection. Int J Prev Med 2011;2:4-9. Jacobson SH, Eklöf O, Eriksson CG, Lins LE, Tidgren B, Winberg J. Development of hypertension and uraemia after pyelonephritis in childhood: 27 year follow up. BMJ 1989;299:703-6. Smellie JM, Prescod NP, Shaw PJ, Risdon RA, Bryant TN. Childhood reflux and urinary infection: A follow-up of 10-41 years in 226 adults. Pediatr Nephrol 1998;12:727-36. Montini G, Tullus K, Hewitt I. Febrile urinary tract infections in children. N Engl J Med 2011;365:239-50. Shaikh N, Ewing AL, Bhatnagar S, Hoberman A. Risk of renal scarring in children with a first urinary tract infection: A systematic review. Pediatrics 2010;126:1084-91. Azzarone G, Liewehr S, O'Connor K. Cystitis. Pediatr Rev 2007;28:474-6. Coulthard MG. Is reflux nephropathy preventable, and will the NICE childhood UTI guidelines help? Arch Dis Child 2008;93:196-9. Powell HR, McCredie DA, Ritchie MA. Urinary nitrite in symptomatic and asymptomatic urinary infection. Arch Dis Child 1987;62:138-40. Wilkins EG, Ratcliffe JG, Roberts C. Leucocyte esterase-nitrite screening method for pyuria and bacteriuria. J Clin Pathol 1985;38:1342-5. Jones C, MacPherson DW, Stevens DL. Inability of the Chemstrip LN compared with quantitative urine culture to predict significant bacteriuria. J Clin Microbiol 1987;23:160-2. Yilmaz A, Sevketoglu E, Gedikbasi A, Karyagar S, Kiyak A, Mulazimoglu M, et al. Early prediction of urinary tract infection with urinary neutrophil gelatinase associated lipocalin. Pediatr Nephrol 2009;24:2387-92. Ichino M, Kuroyanagi Y, Kusaka M, Mori T, Ishikawa K, Shiroki R, et al. Increased urinary neutrophil gelatinase associated lipocalin levels in a rat model of upper urinary tract infection. J Urol 2009;181:2326-31. Cai L, Rubin J, Han W, Venge P, Xu S. The origin of multiple molecular forms in urine of HNL/NGAL. Clin J Am Soc Nephrol 2010;5:2229-35. McCarter YS, Burd EM, Hall GS, Zervos M. Laboratory Diagnosis of Urinary Tract Infections. Cumulative Techniques and Procedures in Clinical Microbiology (Cumitech 2C). Washington, DC, ASM Press; 2009. Cangemi G, Storti S, Cantinotti M, Fortunato A, Emdin M, Bruschettini M, et al. Reference values for urinary neutrophil gelatinase-associated lipocalin (NGAL) in pediatric age measured with a fully automated chemiluminescent platform. Clin Chem Lab Med 2013;51:1101-5. Fagundes C, Pépin MN, Guevara M, Barreto R, Casals G, Solà E, et al. Urinary neutrophil gelatinase-associated lipocalin as biomarker in the differential diagnosis of impairment of kidney function in cirrhosis. J Hepatol 2012;57:267-73. Lubell TR, Barasch JM, Katherine Xu, Maria Ieni, Cabrera KI, Dayan PS. Urinary neutrophil gelatinase- associated lipocalin for the diagnosis of urinary tract infections. MSca PEDIATRICS 2017;140:e20171090. Lee HE, Kim DK, Kang HK, Park K. The diagnosis of febrile urinary tract infection in children may be facilitated by urinary biomarkers. Pediatric Nephrol 2015;30:123-30. Valdimarsson S, Jodal U, Barregård L, Hansson S. Urine neutrophil gelatinase-associated lipocalin and other biomarkers in infants with urinary tract infection and in febrile controls. Pediatr Nephrol 2017;2:2079-87. Makris K, Markou N, Evodia E, Dimopoulou E, Drakopoulos I, Ntetsika K, et al. Urinary neutrophil gelatinase-associated lipocalin (NGAL) as an early marker of acute kidney injury in critically ill multiple trauma patients. Clin Chem Lab Med 2009;47:79-82. Mitsnefes MM, Kathman TS, Mishra J, Kartal J, Khoury PR, Nickolas TL, et al. Serum neutrophil gelatinase-associated lipocalin as a marker of renal function in children with chronic kidney disease. Pediatr Nephrol 2007;22:101-8.